The people of Barnim live and work well. With great commitment in four main commercial fields the inroads for the future are being forged. The offer of activities that close to nature in a beautiful landscape is our trump card in tourism. The region is also reforming itself as a place for health and wellbeing. A functional network lends strength to the efficient development of renewable energies. In addition, there is the network for the metal industries which ties old economic traditions with modern requirements and is helping local enterprises to adapt. However, it is not only in the area of developing trade that the local administration is investing its energies. The infrastructure has also seen great improvements so that the people of Barnim feel they are well cared for. Schools, health and nursing services are being built up, free time, leisure and cultural facilities have been constantly improved. There are further residential areas and commercial sites with all the necessary roads and bridges. The modern “Services and Administration Centre” which has been built in Eberswalde is part of the list of impressive large-scale projects and in Niederfinow the new ships lifting facility, which will be the largest in Europe in 2006. 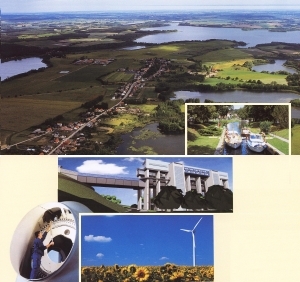 For people living in Barnim there is a well developed infrastructure and the unspoiled natural environment to enjoy with the all too rare commodity of fresh air. New people coming to the area settle in quickly and feel at home. Investors are met by a positive economic climate and well thought through support schemes.